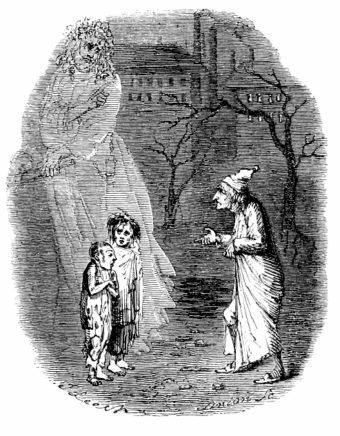 For all the things that Charles Dickens’ “A Christmas Carol” is known for, Tiny Tim, a relatively minor character in terms of appearances in the story (but, importantly, one of wholesome heart despite his physical condition), was one of the characters that Dickens wanted people to pay the most attention to. After all, he wrote “A Christmas Carol” to bring more attention to the plight of the children of the poor- a subject Dickens was extremely passionate about owing to his own experience with poverty as a child. Dickens was born on February 7, 1812 in rural England to a middle class family turned impoverished when his father, a clerk named John, mismanaged his finances and ended up being sent to Marshalsea debtors’ prison. As was the practice at the time, most of the family joined him in jail – but not so for Charles, who was deemed old enough to make his own way in the world. The 12 year old boy was moved into cheap lodgings away from his family, removed from school, and sent to Warren’s Shoe Blacking Factory. His job there was to spend six days per week pasting labels on jars of shoe polish. His weekly pay for this was six shillings (about £22 or $29 today) with which he had to entirely support himself on. It is wonderful to me how I could have been so easily cast away at such an age. It is wonderful to me that, even after my descent into the poor little drudge I had been since we came to London, no one had compassion enough on me- a child of singular abilities, quick, eager, delicate, and soon hurt, bodily or mentally- to suggest that something might have been spared, as certainly it might have been, to place me at any common school. Our friends, I take it, were tired out. No one made any sign. My father and mother were quite satisfied. They could hardly have been more so if I had been twenty years of age, distinguished at a grammar-school, and going to Cambridge. The blacking-warehouse was the last house on the left-hand side of the way, at old Hungerford Stairs. It was a crazy, tumble-down old house, abutting of course on the river, and literally overrun with rats. Its wainscoted rooms, and its rotten floors and staircase, and the old grey rats swarming down in the cellars, and the sound of their squeaking and scuffling coming up the stairs at all times, and the dirt and decay of the place, rise up visibly before me, as if I were there again. The counting-house was on the first floor, looking over the coal-barges and the river. There was a recess in it, in which I was to sit and work. My work was to cover the pots of paste-blacking; first with a piece of oil-paper, and then with a piece of blue paper; to tie them round with a string; and then to clip the paper close and neat, all round, until it looked as smart as a pot of ointment from an apothecary’s shop. When a certain number of grosses of pots had attained this pitch of perfection, I was to paste on each a printed label, and then go on again with more pots. Two or three other boys were kept at similar duty down-stairs on similar wages. One of them came up, in a ragged apron and a paper cap, on the first Monday morning, to show me the trick of using the string and tying the knot. His name was Bob Fagin; and I took the liberty of using his name, long afterwards, in Oliver Twist…. No words can express the secret agony of my soul as I sunk into this companionship; compared these every-day associates with those of my happier childhood; and felt my early hopes of growing up to be a learned and distinguished man, crushed in my breast. The deep remembrance of the sense I had of being utterly neglected and hopeless; of the shame I felt in my position; of the misery it was to my young heart to believe that, day by day, what I had learned, and thought, and delighted in, and raised my fancy and my emulation up by, was passing away from me, never to be brought back any more; cannot be written. My whole nature was so penetrated with the grief and humiliation of such considerations, that even now, famous and caressed and happy, I often forget in my dreams that I have a dear wife and children; even that I am a man; and wander desolately back to that time of my life. Deliverance from this fate came in the form of John Dickens inheriting £450 upon the death of John’s mother, Elizabeth Dickens. With this money, the Dickens family was able to get out of debtors’ prison (though John would later end up back there again, and likely many times, had it not been for Charles, due to a habit of over spending). Eventually, however, he was allowed to quit and go back to school. After quick dalliances as a law clerk at the age of 15 and later a theater actor, he became a political journalist covering the House of Commons. At the same time, he also began to write his first fiction pieces under the pseudonym of “Boz” (a nickname family members had given him). His work began to gain traction, punctuated by Dickens’ marriage to his book editor’s daughter, Catherine, and the publishing of Pickwick Papers – which both occurred in April of 1836. Two years later, he published Oliver Twist and Dickens’ road to literary stardom was paved. In 1843, Dickens was only 31 years old and already perhaps the most famous author of his day. Despite this, he was constantly in need of money. Much like his father before him, he had a habit of seemingly always living at the limits of his means. Unlike his father, however, his means were considerable and generally grew over time. This was a good thing as he was also financially responsible for a large family, which included his wife, (eventually) ten children, a mistress, brothers, sisters, and his parents. While teetering on the edge of financial ruin, a report came out, compiled by one of Dickens’ friends, Richard Henry Horne, that is today considered one of the most important documents in British industrial revolution history. In short, the comprehensive Report of the Children’s Employment Commission details the extreme, unhealthy, dangerous, exploitative, and just generally horrific working conditions many poor children were forced to endure in the UK. There were also more extreme reports of children being killed or mangled owing to being treated as disposable commodities, rather than human beings. For example, it outlines the practice of having children climb into industrial machinery to do things like remove jams, with the report noting cases where removal resulted in the child’s death when the machinery starting again with them still inside of it. On top of this, there were stories of young girls working in garment factories sewing with bleeding fingers- 16 hours per day, 6 days a week. The most shocking thing of all brought to light by the massive report was that these conditions weren’t the exceptions, but more the rule for the children of the poor in the newly industrialized Britain. The report also seemed to debunk by numerous examples a commonly held idea about the poor- that they were only poor because they were lazy, drunks, inherently immoral, lacking in intelligence, or were deformed in some way. Along this line of thinking, proposed government aid to such individuals was intentionally harsh- like the 1834 Poor Law Amendment Act, which stopped government aid to the poor unless they went to a workhouse, with said institutions meant just as much to act as discouragement from being poor as to actually help those in need. As you might imagine from all this, there were frequent scandals that emerged about various workhouses, such as reports of starving residents being forced to eat rotting flesh just to survive. Unsurprisingly, as proclaimed by the unnamed charitable solicitor in A Christmas Carol, workhouses were places that many “would rather die” than go. On this note, the fact that losing one’s job might have meant having to go to a workhouse was something that many business owners used to further exploit their workers. The power of population is so superior to the power of the earth to produce subsistence for man, that premature death must in some shape or other visit the human race. The vices of mankind are active and able ministers of depopulation. His main overarching point here was that overpopulation would inevitably lead to lower wages and worsening work conditions via more workers available, while simultaneously scarcity of food would result in said sustenance becoming more expensive. The ultimate result of all this would be famine and disease as the population swelled beyond what could be adequately sustained by available resources. Eventually this rise in famine and disease would then see the population decrease, reducing instances of famine, disease, etc. Doing anything to stop the natural population die-off of the impoverished, like giving widespread government aid to poor people, would only serve to make the problem worse for everyone by keeping more people alive and breeding. Thus, in his view, laws that sought to help poor people, in reality, helped no one when looking at the big picture and, indeed, hurt society as a whole. Man, if man you be in heart… forbear that wicked cant until you have discovered What the surplus is, and Where it is. Will you decide what men shall live, what men shall die? It may be, that in the sight of Heaven, you are more worthless and less fit to live than millions like this poor man’s child. Oh God! to hear the Insect on the leaf pronouncing there is too much life among his hungry brothers in the dust! In any event, Dickens, like many others, was outraged over what he read in the Report of the Children’s Employment Commission, and the Second Report published in 1843- with the stories perhaps more stinging to him than most wealthy individuals given his own experiences as a child laborer. After all, this would have likely been his own life-long fate, if not for the inheritance from his grandmother. Shortly after reading the Second Report, Dickens declared to one Dr. Southwood Smith that he would deliver a “sledge-hammer” blow on behalf of the Poor Man’s Child. He soon, however, became convinced that the best way to do this was not, as he originally intended, to publish a philosophical pamphlet on the subject, which he proposed to title “An Appeal to the People of England on behalf of the Poor Man’s Child.” Rather, he decided to write a story illustrating the points he wished to impart. rest assured that when you know [it], and see what I do, and where and how, you will certainly feel that a sledge-hammer has come down with twenty times the force — twenty thousand times the force I could exert by following out my first idea. Even so recently as when I wrote to you the other day I had not contemplated the means I shall now, please God, use. But they have been suggested to me; and I have girded myself for their seizure— as you shall see in due time. This is all set the stage for Dickens penning his most famous work, which he began writing in October of 1843, finishing in a mere six weeks. The rush in completing the story was both because he needed money fast and because he had in mind to make it a Christmas tale. At the time, Christmas was considered something of a “second-rate” holiday in much of Britain. However, the holiday had begun seeing something of an upswing in popularity as a festive event in Britain starting around the early 19th century- something Dickens was hoping to capitalize on, leveraging it for a quick burst of sales to supplement his waning income. But I am sure I have always thought of Christmas time, when it has come round–apart from the veneration due to its sacred name and origin, if anything belonging to it can be apart from that–as a good time; a kind, forgiving, charitable, pleasant time; the only time I know of, in the long calendar of the year, when men and women seem by one consent to open their shut-up hearts freely, and to think of people below them as if they really were fellow-passengers to the grave, and not another race of creatures bound on other journeys. And so it was that on December 19, 1843, Charles Dickens’ A Christmas Carol was published. The original run of 6,000 copies sold out by Christmas and the book sold very well beyond, with 13 official editions published by the end of the following year. Unfortunately for Dickens, the profits were not nearly what he’d initially anticipated. For reasons not fully clear today (and something occasionally criticized at the time for, ironically, pricing the book out of the reach of any among the poor), he insisted that the physical book be a prize in and of itself; throwing out initial plainly bound copies, he stipulated that the binding must be top-notch with gold lettering on the spine and front cover. The pages had to also be gold-gilded, accompanied by four full-pages of colored hand-etchings, four woodcut images, and with title pages printed in bright red and green ink. All of this came at a high cost, resulting in the production costs going significantly over initial projections. As mentioned, this also priced the book out of a range that any among the poor could ever afford, though perhaps Dickens didn’t mind this; while the book was technically for the poor in some sense, his target reading audience on this one was actually those who were a bit more affluent- perhaps explaining his choice to spare no expense in the physical book’s construction to help it appeal more to the wealthy on look alone. Whatever his true motivation here, despite the book selling well, the initial high production cost left him with a marginal profit of just £230 off the first run (about £20,000 today), a number that was reportedly about four times less than he had expected. Subsequently, countless counterfeiters published and sold the story themselves (strong copyright protection not really being a thing at the time), further hindering his profits in later editions, though he would go on to make a fortune on the book largely thanks to live readings of the story, which included Dickens acting out the parts while he read. While not initially achieving the goal of solving his financial difficulties (though it did, at least, help), the book had the intended effect on the public, with it claimed in Gentleman’s Magazine in the spring of 1844 that A Christmas Carol was directly responsible for the significant rise in charitable giving that occurred in Britain the months following the publication of the book. What was Wrong with Tiny Tim That 19th Century Medicine Could Have Cured Simply By Throwing Money at the Problem? Where Did the Saying, “I’ll Eat My Hat” Come From? As for the name “Ebeneezer,” the origin of this name would not have been lost on his many religious fans. This is derived from the Hebrew for “stone” and “helper”- thus the “stone of help”. In its mention in the Bible, the particular stone named Eben-haezar was used as a symbol of remembrance of the Israelites’ defeat of the Philistines with the help of divine aid. Thus, it is speculated that Dickens’ choice of first name for the character was chosen perhaps as Scrooge himself was to function as something of a “stone of remembrance” for everyone- helping people to remember to keep a spirit of charity not just on Christmas, but all year round. Whether that was Dickens’ intention or not, another interesting word choice not familiar to many today outside of this story is the word “humbug”. So what’s a humbug? At the time, this word simply meant something (or someone) that was an imposter or a fraud. Hence, when Scrooge called Christmas a humbug, he was calling the whole idea of the holiday a fraud. How closely has the Bonus Fact, concerning the origin of Ebenezer Scrooge’s name, been researched? An article in the Scotsman, December 24, 2004, says that Dickens’s diary reports his visting a cemetery in Edinburgh where he found the grave of a corn merchant, whose stone bore the legend “Ebenezer Lennox Scroggie – meal man”. Dickens’s poor eyesight and the dim light caused him to read the last bit as “mean man”, which inspired the character of Scrooge.